A very pretty fruiting S-Shaped Sweet Plum indoor bonsai tree for sale with drip tray. A wonderful Valentine's Day gift with pretty heart shaped balloon and 'Love You' ribbon. With free delivery to most areas this pretty 8 year old bonsai makes a wonderful gift. You can choose from gift wrap & personalisation options below. 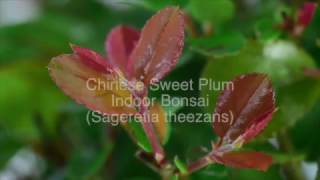 The Sweet Plum is a lovely bonsai with has small purple fruits as it matures and lovely red flecks to the new foliage tips. • Elegant fruiting indoor bonsai with lovely S-Shaped trunk, which displays lovely red/tan new foliage and small purple fruits as it matures, potted into an blue ceramic bonsai pot.